Probably Sony is giving them "something" to encourage making it Vita only. I still think PSO2 is heading to the PS4, seing how PS4 has some F2P games in the West. Maybe SEGA and Sony have make a deal about helping localizing both games in the West (probably no/later PC release then) and some advertising. Dengeki is a website (it's also a brand of magazines / a book and manga imprint) that publishes sell-through Japanese sales data from ASCII Media Works, Inc. Every week they publish a nationwide snapshot of Japanese video game sales with the cooperation of more than 3,000 specialty game stores and convenience store chains all across Japan. Among other reasons, Dengeki gives us sales numbers for titles that are too low to debut with numbers on Media Create / Famitsu. So, their liberal reporting allows us to track sales that we wouldn't be able to otherwise. + Nationwide Japanese sales data from ASCII Media Works, Inc.
At least, this one sold more than 10 copies. Getting beat by 360 is shameful though. I reckon RE: Revelations HD sold better on Wii U than 360 in Japan. Between this and the UK sales (1% or <200 units), Ubi must be really glad they bothered. What is there not to understand? Don't tell me you were expecting it to sell well? Also, 3DS is up. The wait for those killer apps must be getting out of hand. Kinda reinforces the "Nintendo gamer" stereotype, eh? Why the big difference between PS3 and 360? It's the XBOX360 in Japan. Not an awesome week for Nintendo. Are there any big 3DS releases coming up this fall that might makes waves? In that case they're better of focusing on just a handheld. At least there's a market for that. A hybrid is a wholly unproven model that constitutes pouring all their eggs in one basket with the high risk of providing the worst of both worlds. The WiiU's problems hinge more on Nintendo's lack of preparation and foresight, I think, than their inability to support two consoles, in my opinion. Sony, arguably, are proving themselves unable to support two consoles. If they can't, I'm really not convinced there's a way that Nintendo can unless they expand massively. Eh, Monster Hunter 4, Pokémon. Alcohol. Right before the contracts were signed. It's not late for the party. You are invited next week. Yeah, I realized that as soon as I posted. I am retard. Oh, my bad. Makes sense. If Mario Kart 7 underperforms we'll wait for Smash Bros.
Andrew House: Vita TV is intended as a competitor to existing set-top boxes, aimed at casuals and families, not core gamers. Google Inc's "Chromecast," Apple Inc's "Apple TV," etc are considered as rivals to the PS Vita TV. As an advantage of the PS Vita TV, SCE emphasizes that it allows to use a variety of games. At this point, more than 1,300 titles of games in various categories can be played. They have a wide price range, making it easy for users to buy them. With the lineup and prices, we can reasonably expect that the PS Vita TV will gain in popularity. The PS Vita TV was developed mainly for those who have fun with contents with family members in a living room. The concept of the PS Vita TV was created in about August 2011, four months before the release of the PS Vita. After that, SCE discussed it many times and started the development of the PS Vita TV in earnest about a year ago. Speaking of the games for the PS Vita TV, SCE expects that they will be played by casual gamers rather than serious game lovers, at whom the PS4 is targeted. Expecting such users, the company set a goal to sell the PS Vita TV for a price lower than ¥10,000 (approx US$99.5) at the beginning of the development process. In fact, the price of the PS Vita TV is ¥9,480 (excluding tax). ...huh. Well, maybe the sales figures will surprise me, and either way, it's fair to say that this doesn't cost Sony a lot in terms of additional R&D or manufacturing. That's why it'll be a good idea for Nintendo to put the WiiU's "insides" to good use in the future and not dismiss it like they did with the Wii & WiiMote. Yeah, its not only the console itself that is cheap but the games as well considering the wide range you can choose from. Makes it a pretty cheap console to own from the hardware to the software. I don't see why the Vita TV will be successful in Japan. It has games that one could play on an actual portable PSV. Why would a box that allows one to play the same games that they can play on a handheld device, which seems to be more preferable than a box for the TV in Japan. That's the issue with Splinter Cell selling so poorly on the Wii U. First, let's operate under the assumption that PS3 / 360 / Wii U sales for Splinter Cell: Blacklist represent the theoretical maximum. Of course, it's very likely that the Wii U version did not sell 1,493 copies at launch. That's its maximum threshold. It can be reasonably assumed that the Wii U of Splinter Cell: Blacklist had 3% to 5% of the marketshare in Japan in its debut week. This is a direct example where the Wii U version of a game---when sold at the same time, for the same price, and with nearly the same features as its PS3 / 360 counterparts---has underwhelmed relative to its other platforms. This can be partially attributed to lack of userbase, or the fact that the Wii U version is missing offline co-op. But it can also be connected to an underlying dread...the kind of dread that gets consoles like the Wii U into a negative feedback cycle. 6) The Wii U endures negative developer sentiment from the stigma of being a "first-party machine"
Just repeat that cycle (steps 1-10) over and over again. Nintendo is falling into this vicious cycle as the few third-party retail games that are coming out for the system (Yakuza 1&2 HD, Splinter Cell: Blacklist) underwhelm. It may not be the case that the Wii U is completely unworkable for third-parties. After all, Capcom and Square Enix were able to utilize the Wii U to sell their flagship IPs (Monster Hunter 3 Ultimate at >200K and Dragon Quest X at >72K) above non-abysmal levels. But the problem is that this negative feedback cycle is caused by PERCEPTION. When developers perceive a console as "dead," it becomes a self-fulfilling prophecy. I think the WiiU shows how many gamers (not expanded audience, who hasn't returned) are willing to buy a console solely for Nintendo's traditional games (sorry Wonderful 101). So at the moment, that's 3 million worldwide, correct? Which I would guess isn't enough to sustain an HD console endeavor. Which should let Nintendo know that they need to "attract more than just Nintendo gamers" when they make their next console. I don't know in what way that would be accomplished though. I think the 360 version of Splinter Cell sold better than the Wii U version because the userbase was built for western games on the 360. So you're saying it will get those impulse buyers because it is cheap? Even after 7 years on the market the PS3 is still not in impulse buy territory. PTV is probably the only current dedicated gaming system that hits that note. Even the 2DS will be $30 (?) more expensive. Aside from the great idea the main thing Sony nailed with VitaTV is price. It might also provide a venue for Japanese devs to dive back into making console games, being unable to keep up with the tech and costs of the PS3 and all that. But just getting impulse buyers won't make it successful. It will just get impulse buyers and early adopters, not the market at large. The VitaTV loses what is one of the most appealing things about the Vita, which is that it is a handheld. Why would a handheld device now set-top box will get Japanese devs back into console games? All games on Vita TV would be on the Vita. Its not just about impulse buyers. VitaTV is basically a sub-PS3 gaming console, and a very cheap one at that. The VitaTV and Vita are part of one whole imo, not separate products, one selling equally benefits the other because its all about the user base. The bigger it is the more games they will get. This is a direct example where the Wii U version of a game---when sold at the same time, for the same price, and with nearly the same features as its PS3 / 360 counterparts, has underwhelmed relative to its other platforms. It may not be the case that the Wii U is completely unworkable for third-parties. After all, Capcom and Square Enix were able to utilize the Wii U to sell their flagship IPs (Monster Hunter 3 Ultimate at >300K and Dragon Quest X at >72K) above non-abysmal levels. I'm not going to pretend I have what it takes to run a company, but NCL needs to get a software ecosystem in place for their handhelds and home consoles as soon as they can. A universal Nintendo OS, Miiverse and unified account is a must. Get this on a WiiU 2.0 [console] and a WiiU 1.5/2.0 XL [handheld]. I think this will help out. Dengeki didn't provide sell-through percentages for the entire reporting period. Thought this was really interesting how the overall software sales on the year were that close between Nintendo and Sony platforms, definitely not what I was thinking would be the case. Obviously those percentages are going to shift quite a bit in the very near future. I don't even know why Microsoft bothers with Japan to be honest. This is all kinds of crazy. Missing the forest for the trees a bit. Whatever major policy shift that occurs at Nintendo to make it successful in the modern age will result in those features, but they're the consequence, not the cause. On an unrelated note, why doesn't the OP have the Famitsu Xbox 360 figures? 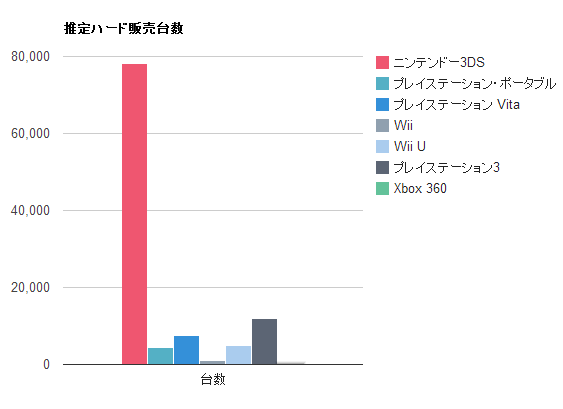 ...that Xbox 360 has sold 157 units this week, according to Famitsu. He probably forgot to include it. Not a surprise...it's at least another revenue stream (if not a particularly significant one) and if it gains traction, all the better for them. Well if they sell 500k of VTV in Japan they increased Vita userbase by 1/3 to put it in perspective. Good point, though I wonder what effect the Vita TV may or may not have in driving software sales. Definitely can't hurt to grow the userbase if the investment on Sony's part is low enough to justify it. Nah, I doubt Sony money hatted it. And Kuma Tomo will be at 50,000 next week! Wow! But why is it only for Vita on consoles? Why not a PS3 / Vita dual release, especially since PSO had no problems being on consoles in the past? Could be due to the Vita having a more modern OS, which might make it easier to keep the console version in sync with the PC one. Having to wait for patches and new content to be certified and processed is typically the main reason we don't see many games offer cross-platform multiplayer for the current gen. Things seem better on the PS4 with games like War Thunder offering cross-platform play, and it might also apply to the Vita.